When Jimmy Nuter first went inside an old farmhouse on North Wolcott Avenue in Chicago, he didn’t think he’d find much. But sometimes, he says, you just get a feeling. Over the years, Nuter has entered lots of homes – more than 13,000 since 1996, he figures – doing architectural salvage work for his company, American Vintage Reclamation. And he wasn’t ready to give up on the farmhouse, so he went up to the attic. But all he found there were some old letters and business cards, and he was about to leave. “Just at that point I stumbled upon the first glass plate,” he remembers. They were glass plate negatives – dozens of them. The kind common in photography until the early 20th century. He let window light shine through one and saw a large dog. Then a woman in a chair. There were 75 altogether. He brought them home where there was an amazingly fortunate resource: Nuter’s partner, Kari McCluskey, is an artist who works at the Art Institute of Chicago and uses glass plate photography in her own art. As they carefully cleaned and scanned the photos, what they saw took their breath away. 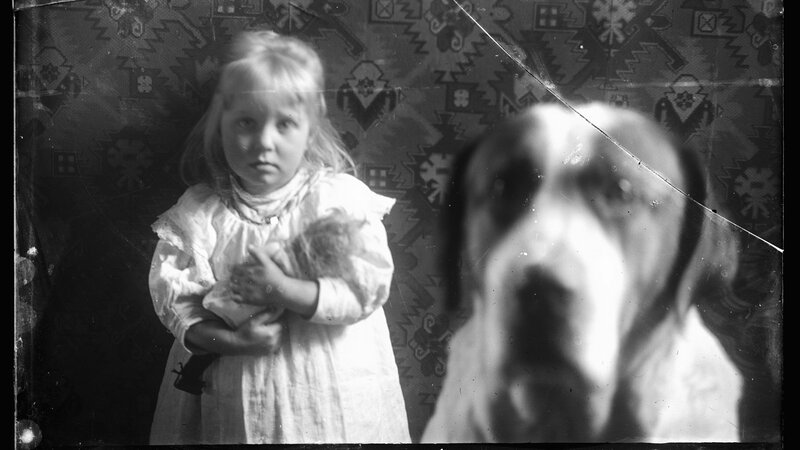 Many photos showed a mother and child – and that large dog. And most of the photos were taken in the house where Nuter found them. But who were these people? And why were they using a type of camera generally used in studios for more formal portrait work? With help from the letters and business cards Nuter found in the attic, they were able to piece it all together. The home belonged to Hermann and Hedwig Schultz. He was a portrait painter who arrived in Chicago in 1893. Apparently, he used the camera to photograph his subjects as a reference for painting them. And it turns out that the little girl, Sigrid Schultz grew up to be a groundbreaking foreign correspondent for the Chicago Tribune. “She was a very, very big deal,” says longtime Tribune reporter Ron Grossman. The house on Wolcott Avenue had at least nine owners after the Schultzes left Chicago in 1901. And apparently, no one ever thought to look very carefully in that attic – until Nuter arrived, just days before it was torn down in late 2018. There is a Sigrid Schultz archive at the Wisconsin Historical Society, and a collection of Hermann Schultz paintings at the Vesterheim Norwegian-American Museum in Decorah, Iowa.